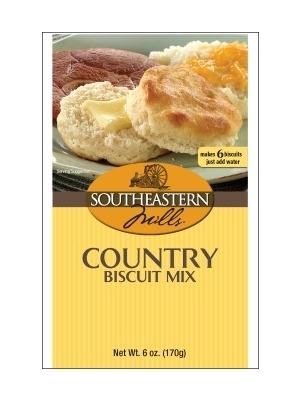 This Country Biscuit Mix offers made from scratch quality! It will help you to create warm and fluffy biscuits that are perfect for serving with any meal! Preheat oven to 400 degrees. Combine biscuit mix and 1/4 cup water or 1/3 cup buttermilk. Mix with fork until a soft dough is formed with no dry or wet spots. If dough is too dry, add more liquid (about 1 tablespoon) or if too moist, add small amount of flour. Form dough into ball. Place dough onto floured surface or pastry cloth. Lightly sprinkle dough with flour. Knead 4-6 turns. Roll or pat dough to 1/2 inch thick. Cut dough with floured standard biscuit cutter. Reform dough, roll and cut biscuits until all dough is used. Place biscuits, slightly touching, onto greased or ungreased baking sheet. Bake approximately 12-15 minutes or until slightly browned. Enjoy! BLEACHED ENRICHED WHEAT FLOUR (WHEAT FLOUR, NIACIN, REDUCED IRON, THIAMINE MONONITRATE, RIBOFLAVIN, FOLIC ACID), PARTIALLY HYDROGENATED SOYBEAN OIL, DRIED BUTTERMILK, LEAVENING (SODIUM BICARBONATE, SODIUM ALUMINUM PHOSPHATE, MONOCALCIUM PHOSPHATE), SUGAR, SALT, WHEAT STARCH, MONO AND DIGLYCERIDES.